With guitars, bodhrans and mandolin in hand, The Sorries sing, play and banter their way through a show inspired by the music of The Corries. Performing a selection of songs from the much-loved Scottish songbook – some dating back over 300 years – the pair’s arrangements and harmonies make the tunes sound as vibrant as ever. 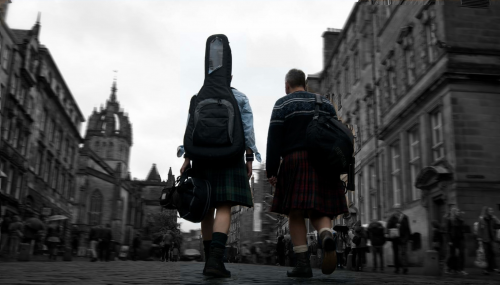 Their 12 year career has seen The Sorries travel the country playing venues as diverse as Murrayfield Stadium, the Isle of Eigg Community Hall, Hampden Park and the Thomas Paine Chapel in East Sussex. 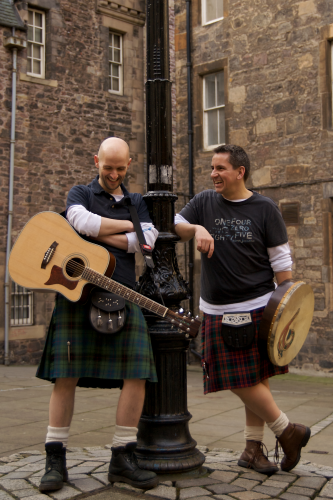 The duo’s annual shows at the Edinburgh Festival Fringe – numbering almost 200 over 10 years – have established them as firm Fringe favourites and helped to build a loyal fan base which stretches from Clapham to California, and from the Western Isles to Western Australia.